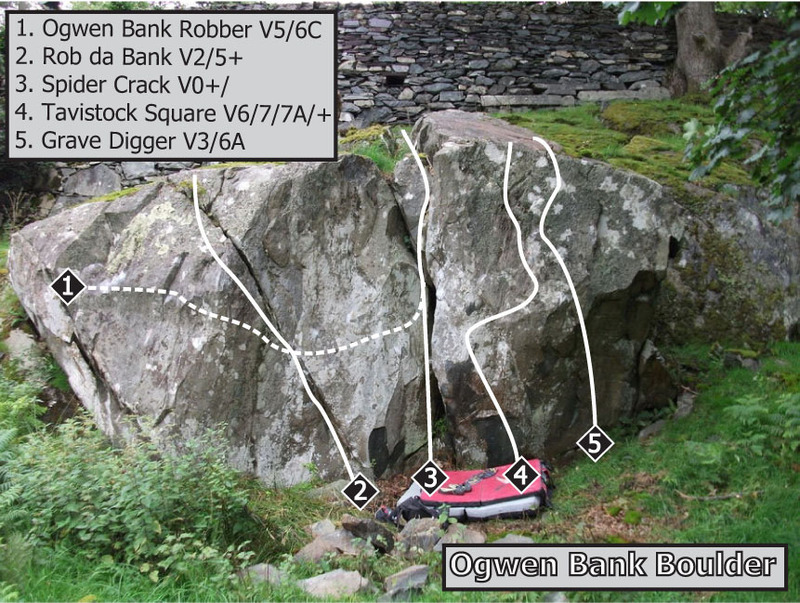 Phil Targett has developed a superb new boulder at Ogwen Bank on the outskirts of Bethesda. 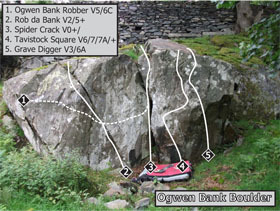 The Ogwen Bank boulder sits just below the A5 approximately 200m from the Ogwen Bank caravan park entrance. 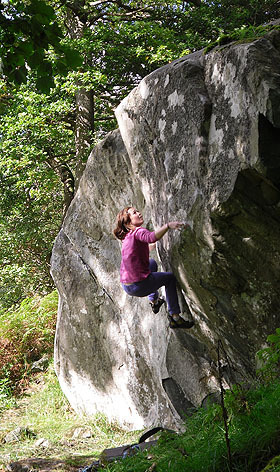 The hardest line is Tavistock Square V6/7/7A/+, a brilliant sds just right of the central crack. This starts with a finger flake for the right and the left hand on the arête. A series of precise, slappy moves lead up and rightwards to better holds high on the face and an easier top out. The rock left of the crack is (obviously) out of bounds, as is the upper section of the arete. The two cracks provide good warms up and can be done from sitting starts. The right hand line, Grave Digger V2/5+ goes from a standing start and uses the top holds on Tavistock Square, albeit with the left rather than right. Lastly there is a tricky traverse line sweeping in from the left to finish up Spider Crack; Ogwen Bank Robber goes at V5/6C. Enthused Si Panton after a visit. To reach the boulder park at the Ogwen bank layby (as per the approach to the Wave). Walk along the road (in the direction of Ogwen Cottage) for 100m and cross a metal gate on the right into a field. Follow a vague path through the field until the boulder comes into view on the left, just below the road wall. NB. On 3rd March a hold snapped off Tavistock Square it's not absolutely essential but does make it a bit harder.